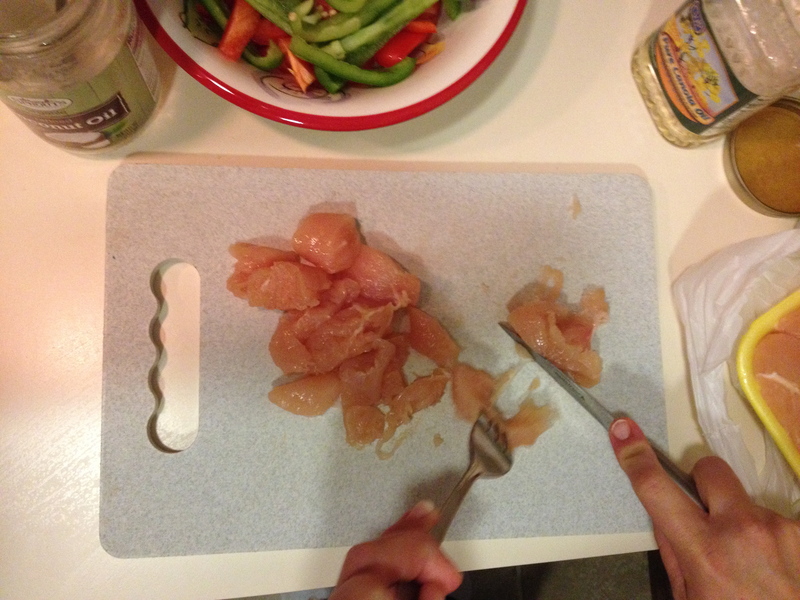 I despise handling raw chicken. My husband usually separates it for me and if I can get away with not having to cut the chicken before I prepare a meal I try. But sometimes it’s unavoidable. The recipe calls for cubed chicken not whole tenders. And then my hands have to touch the chicken. Yuck. Not fun. Sure, I could use gloves but they make things awkward and can get pretty expensive. 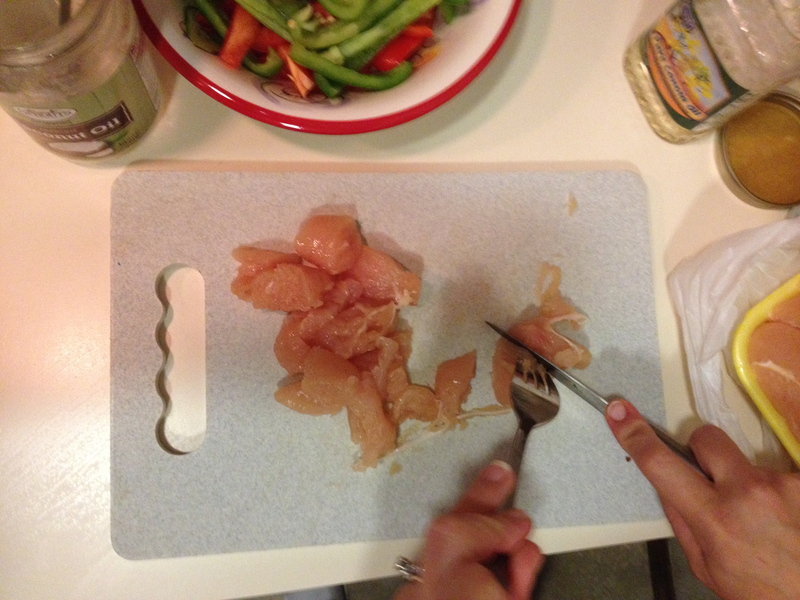 So the last time I had to cut chicken, the light bulb came on. What if I grabbed a knife AND a fork and cut the chicken like I could cut a prepared steak? The fork keeps the meat in place and the knife can work its magic and I don’t have to touch the meat at all! As I write this, I’m thinking this is so simple. Such a no brainer but I’ve been cooking regularly since we got married over 5 years ago and NEVER thought to do this and I haven’t seen anyone else do it when observing others cutting chicken. Hope this helps you out. It has revolutionized my life. Well, that may be a bit dramatic but it has definitely helped me in the kitchen. What about you? What tricks do you use to help keep your hands free from the less than savory parts of cooking? I’d love to hear your thoughts! This is so smart!! I must wash my hands a thousand times while cooking!! I bet this really helps! This is so smart!! You’re right – it seems obvious but I never thought of it either! I tend to cook then shred then throw it in whatever dish. Great meeting you today! I don’t like chicken either, so slimy and yuck. This would be a great tip to keep your hands from freezing too when it’s cold from the freezer. Great idea! I have alway preferred to cut chicken a little on the frozen side (it cuts more easily and not as slimy) but my hands would always get sooo cold. This definitely eliminates that problem. Thanks for stopping by!